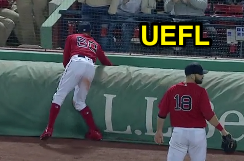 A Boston blooper turned into a Baltimore blunder Friday at Fenway Park when Orioles batter Adam Jones' pop-fly in shallow right field fell onto the field's tarp, setting up a challenge to determine whether the ball was stuck, lodged, or free, as Red Sox RF Mookie Betts threw out a jogging Jones, who had eased up, assuming the ball was out of play. Replay Review: O's Manager Buck Showalter challenged 1B Umpire Stu Scheurwater's ruling that the baseball was live and in play along the right field wall. Any fair ball which, either before or after touching the ground, passes through or under a fence, or through or under a scoreboard, or through any opening in the fence or scoreboard, or through or under shrubbery, or vines on the fence, or which sticks in a fence or scoreboard, in which case the batter and the runners shall be entitled to two bases. Rule 5.06(b)(4)(F) is the equivalent for runners ("...Two bases, if a fair ball bounces or is deflected into the stands outside the first or third base foul lines; or if it goes through or under a field fence, or through or under a scoreboard, or through or under shrubbery or vines on the fence; or if it sticks in such fence, scoreboard, shrubbery or vines"). Is this ball stuck behind the tarp? When it comes to tarps, the Universal Ground Rules simply states, "A catch may be made on the field tarp." Fortunately the MLB Umpire Manual helps further establish that Rule 5.06(b)(4)(F) applies to tarps: "A ball that goes behind a field tarp or wall padding without leaving the playing field should also be considered to be lodged and the same two base award applies. The determination of whether a ball is lodged is subject to Replay Review." We usually see this with batted balls that roll to the outfield wall, when the question becomes whether or not the ball has become stuck in the small space formed by warning track, base of the wall, and bottom of the wall's padding, which generally protrudes several inches onto the playing field. Colloquially, as long as the ball indeed sticks underneath the padding, it is considered out of play. If the ball remains in motion or appears loose, it is considered in play simply because the ball has not yet proven itself to be "stuck" or otherwise out of play. For instance, a ball that rolls underneath wall padding, only to carom back onto the naked warning track is in play. Related Post: Cause You're Stuck in the Wall - Batted Ball Out of Play (9/20/16). Cederstrom & Scheurwater await a decision. Back to Fenway, the potential lodge location is created by the curved tarp and vertical padded wall: as long as the ball is moving and accessible to the fielder, it is live and in play; when it comes to rest, it may be deemed "stuck" and out of play. Here is some support from MLBUM, regarding its interpretation of batted balls that land on top of outfield walls—not directly applicable, but the interp gives an idea of how motion influences a ball's status: "A fair fly ball striking the top of the outfield wall and remaining on the top of the wall shall be deemed a ground-rule double...A fair fly ball that strikes the top of the outfield wall and is picked up by a spectator while still in motion shall be ruled a home run. A fair fly ball that lands on top of the outfield wall and is picked up by a spectator after coming to a stop shall be deemed a ground-rule double." 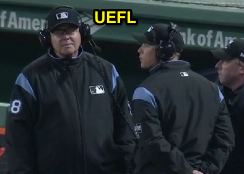 Related Post: Replay Review, Ground Rules, and Levi's Landing (9/1/17). Hidden from view, this ball is not dead yet. Conclusion: As long as the ball is still in motion and accessible to a fielder, it is alive and in play, if for no other reason than it is not yet dead; once the ball stops moving, it is subject to remedial action, such as Rule 5.06(b)(4)(F), and a two-base award from time-of-pitch would be appropriate. As umpire Mike DiMuro once said, "Ultimately, the proper ruling must be made by the base umpire who is responsible for the flight of the ball – and it is only possible to do so by running out to the fence to visually discern and confirm that the ball is indeed lodged or stuck. If the fielder dislodges the ball by grabbing it and removing it, then it can no longer be considered lodged or stuck." 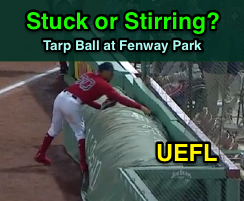 Because of Betts' speed in retrieving the baseball, however, it is difficult even with instant replay to determine whether the ball came to rest—whether it was truly stuck behind the tarp. 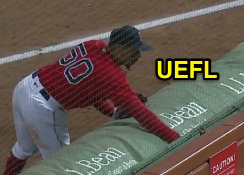 The Replay Official, faced with this inconclusive evidence, ruled that the call should stand: Jones is credited with a single and Betts with a 9-6 putout.